Sea Gypsies make Semporna complete | Daily Express Online, Sabah, Malaysia. SEMPORNA: Semporna in Sabah has gained popularity as the gateway to world-famous diving destinations, but one must not discount the Bajau Laut (Sea Gypsies) who have made it an attraction in their unique way. They picked up the languages while doing what they do best – selling the sea produce from their four-to- five-feet-long hand-made wooden boats. The sea is still their main source of living – fishing, collecting clams and mussels, and even pearl farming in the remote islands, and they still retain their gypsy lifestyle. 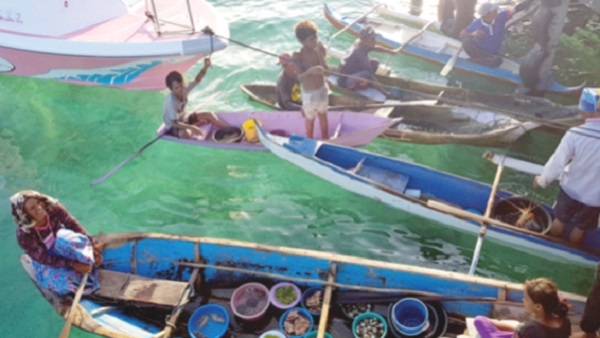 The Bajau Laut living around Semporna number around 3000. They celebrate a popular annual festival called Regatta Lepa with their unique customs and traditions. Their boats are called lepa. In the evenings, one can see dozens of these lepa boats coming home with their day’s catch. As such, the cultural experience of Regatta Lepa is certainly not to be missed when one visits Semporna. The plight of the sea gypsies has remained largely unchanged as they have always been, and still are, stateless people, despite the Sabah Government’s efforts to look into their citizenship status.